Basically all srm's from Genesis/MD games that I've tried can be backed up and sent back to the carts if unmodified by an emulator. Any saves either modified from playing on an emu or created via an emu do not transfer back. With SNES games there is no such problem. The file does get moved as indicated by the date on file but as soon as I try it in a real console it's back to zero without the save. I have the savewrite to 0 and sega16 to 1 as instructed. This is very frustrating and disapointing. Any help would be tremendously appreciated. Is there a list of SNES and Genesis game saves that are known to not transfer correctly? For example I read that Phantasy Star IV does not transfer well and neither do the flash memory type cartridges such as Sonic 3 and Wonderboy. 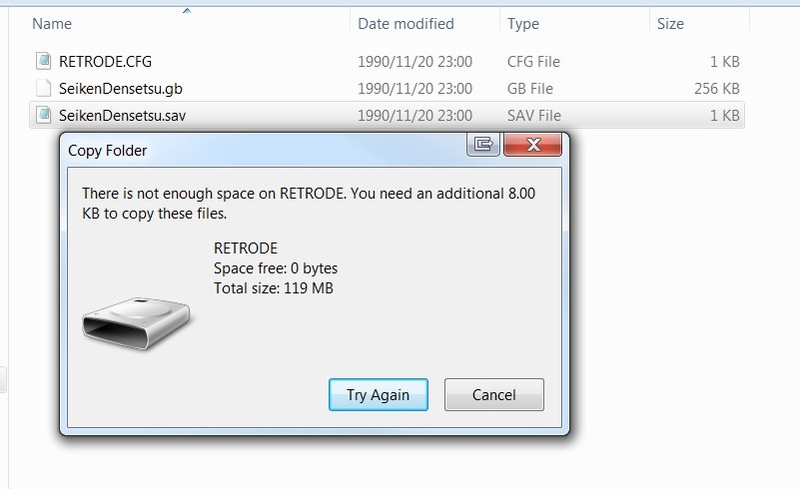 In the case of transfering from the PC to the Retrode does deleting the existing srm and renaming the one on the PC to the matching name on the cartridge, then dragging it to the cartridge suffice? I would like to learn the proper way but am not very good at this so any help with clear tutorials would be greatly appreciated. EDITED; I feel so silly, in my original message I mentionned how two gameboy games stopped working after using them in the Retrode. Turns out the Gameboy was simply low on batteries and so the games work fine. However, the save games saves were not transfered, I mean they did end on my PC but they're blank saves as in it starts up as if there were no saves. Apologies to Matthew. Are GB srm transfers not yet fully functional?